Halloween takes on a whole new dimension in Los Angeles. Everywhere I look I see signs advertising for Dia De Los Muertos with multiple celebrations around the Greater Los Angeles area. We went first on Saturday Oct 28 to Pasadena's tour of altars which turned out to be a way for the business community to draw customers into the different shops that hosted altars. Cute but very commercial. Sunday, Los Angeles' Olvera street in downtown LA hosts a big bash. And even thought the souvenir-lined alley is one of the biggest tourist traps in LA, especially for Mexican goods, it put on a real party. The permanent stalls selling a myriad of colorful goods empties out on Los Angeles Plaza, a zocolo, or city square. The big guys built their altars here. That's altars that were on average 10 feet wide and 8 feet deep. The place was packed and the music enlivened the atmosphere even more. 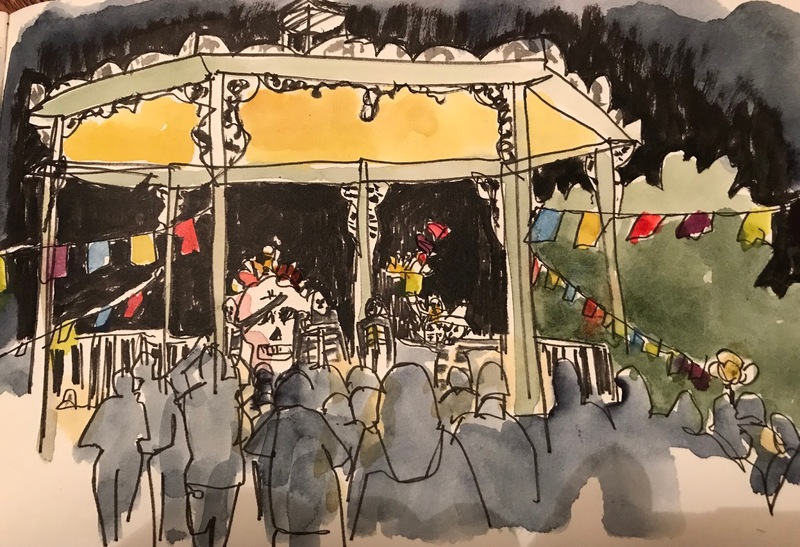 Food carts, oversized skeletons, and Aztec dancers all added their flavors to the colorful pot. While I was sketching a woman came up and asked if I was with a group. When I mentioned Urban Sketchers, she nodded in recognition. It was Stephanie Lowe, a long time urban sketcher who was there with her high school photography class. Just after sunset the plaza bandstand became the stage for an extravagant performance featuring skeletons telling elaborate tales and singing ballads which I can only guess (because it was in Spanish) were lamentations for fellow deadheads. 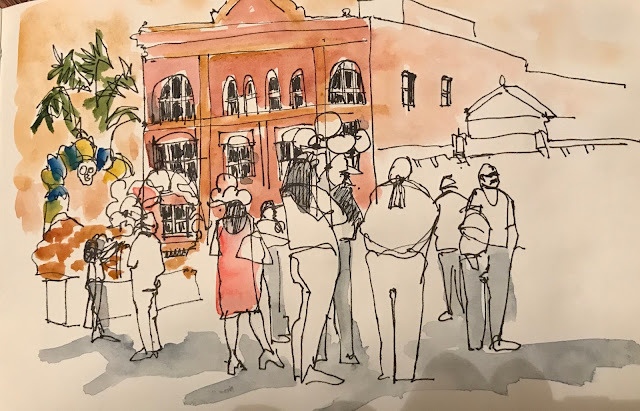 As we enjoyed our mole and enchilada dinner back on Olvera street, the nightly procession marched within inches of our table. And that was just the beginning. Today at the public library I picked up another brochure advertising at least eight more Dia de Los Muertos events around the city. I guess I'll be carting around my watercolors for a few more days. Enjoying your blog And Instagram! I met you at the Chicago Symposium. Especially impressed with your treatment of nighttime scene. Yes! I remember you Susan. We had lunch one day. I've been following you on instagram. Wow! Your sketches are really pretty and show how differently you see the world. You must put up an exhibition in any of the LA venue. These paintings are definitely the one to be exhibited. Wonderful job done! I loved it. Keep posting more like these.